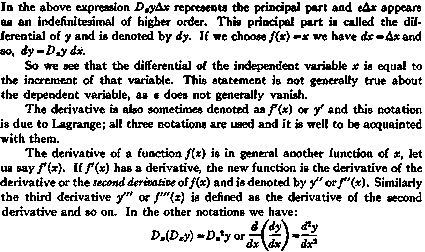 Having introduced these few definitions it must be emphasized that the main importance of the calculus is in its central idea; namely, the study of a continuous function by following its history by indefinitely small steps, as the function changes when we give indefinitely small increments to the independent variable. As was emphasized before, the whole psycho-logics of this process is intimately connected with the activities of the nervous structure and also with the structure of science. In this work we are not interested in calculations, complications, or analytical niceties. Mathematicians have taken excellent care of all that. We need only to know about the structure and method which help to translate dynamic into static, and vice versa; to translate 'continuity' on one level, or order of abstraction, into 'steps' on another. function of the variable x expressed by a group of symbols to the right of the sign of equality.